When thinking about sustainable brands, Sweaty Betty may not immediately spring to mind, but they are really great when it comes to social sustainability. They provide quick, easy and free access to top trainers and class instructors through their collection of online fitness videos and in-store classes. And, this January they’ve created a 31-day fitness programme for anyone to download for free, just click here. Whilst health, wellbeing and fitness are continuing to become an increasingly popular concern, access for the masses to the latest classes by high-profile instructors is becoming more and more limited, largely due to the high cost of luxury gyms and studios. 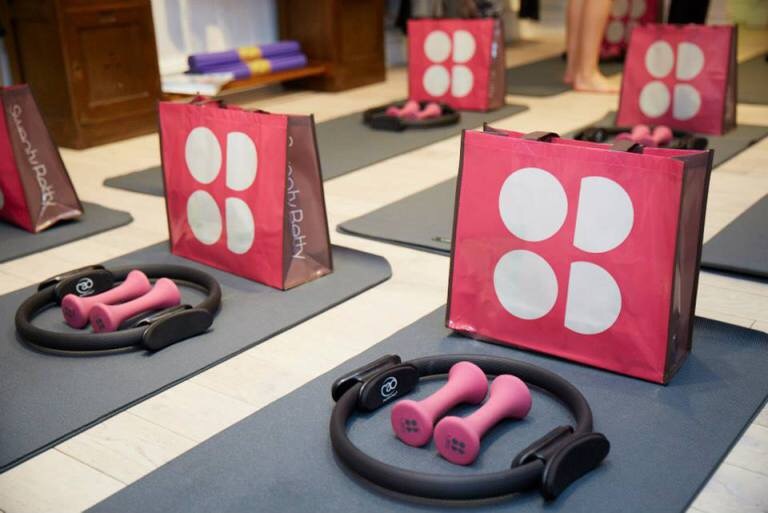 So Sweaty Betty are really giving back to the local communities the stores are located in, as well as anyone with access to the internet, by providing a platform for people who may not otherwise have been able to reach these classes. Encouraging an active and healthy lifestyle is so important, and Sweaty Betty are really trying to lead the way towards a more physically and mentally fit society. Here’s a photo from my amazing trainer Chiara Pellegrino‘s Sweaty Betty class on Thursday morning’s at 8am in Marylebone. It’s her concept class, TotalBody, which combines resistance training with cardio combinations to keep you sweating and smiling throughout – I love it! Sweaty Betty are also experimenting with more environmentally-friendly fabrics and designs. They currently have a range of bamboo tops, which are soft on the skin and have antibacterial properties. Similarly, they offer a number of reversible leggings. Reversible items allow you to create two different looks using the same amount of material needed for just one. This not only reduces how many leggings you buy and how much you spend per pair, but also the amount of space needed to store your workout wear. And research shows that less clutter equals stress (UCLA, 2012; S. Carter Psy.D., 2012), so it’s win-win-win right?! Plus, reversible items are inherently more sustainable as they require fewer resources than would be needed to make their separate counterparts. According to the WWF, it takes 2,700 litres to produce the average cotton shirt (unfortunately they don’t have any stats on gym leggings! ), so if you buy a pair of patterned leggings that reverse into a plain black pair, you’ve used far less water than if you’d bought two! They also stock a couple of “eco” yoga mats. I’m currently working on a post explaining what these are and their benefits – it should be up by the end of the month so watch this space! In short, PVC has typically been used for yoga mats in the past, but it has many negative health and environmental impacts. Instead, the Sweaty Betty eco yoga mat is made of TPE (thermo plastic elastomer) which is both recyclable and degradable. They also stock the Liforme mat which is made of a natural rubber, also recyclable and biodegradable, with intelligent markers to guide you into the correct alignment during you practice – I have one of these and I absolutely love it, but more on this in my upcoming post. Let’s hope this is just the start of a more sustainable, environmentally-friendly product range by Sweaty Betty! Next What is an “eco” yoga mat and where can I get one?